Will Packard Bell's ultraportable leave you with a flutter in your stomach? Having been acquired by Acer last year, Packard Bell has set about overhauling its line of laptops. Here we take a look at a pre-production model of the EasyNote Butterfly S-EC-010 which, assuming issues are resolved concerning the particularly poor keyboard, shows it has the potential to compete in the ultraportable market. The 13.3-inch screen is fairly typical for ultraportables, but the image quality is well above average. While the panel shares the same pixel resolution as many of its peers, it is a lot brighter and offers more accurate colour reproduction, making it well suited to photo editing. A glossy Super-TFT screen coating is in place and it's one of the more reflective offerings we have seen. The solid chassis is built from a hard plastic and features a brushed aluminium palmrest that looks great. There are a number of hotkeys which not only give you quick access to Packard Bell's PowerSave software, but which also help you balance performance and battery life, as well as provide a back-up function which backs up your computer to a location of your choice. The lid is built from a combination of matt and shiny plastics and looks very stylish. The keyboard is very spongy, however, and unfortunately provides one of the worst typing experiences we've had in an ultraportable. Internally, an ultra low-voltage Intel Core 2 Duo processor and 4GB of memory provide good enough performance for multi-tasking word processing documents and spreadsheets, and you can easily run multiple multimedia applications, with ample performance on offer for even the most demanding editing suites. Packard Bell has bundled the prestigious Adobe Photoshop Elements software. 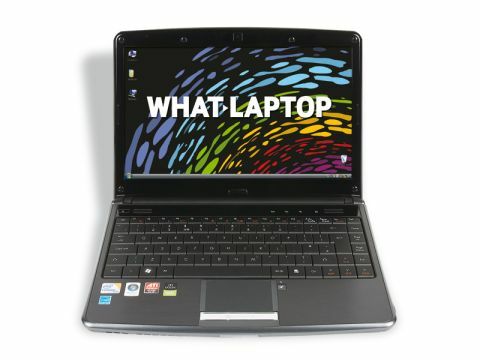 Thanks to the dedicated ATI graphics card, the laptop is able to run the application very quickly, making it easy to edit your photos on the move. The 250GB hard drive provides more than generous storage. There's no optical drive, however, although an external one is included. Connectivity is impressive for a machine of this size, with both 802.11n Wi-Fi and Gigabit Ethernet available for fast connections to networks. There's also Bluetooth for connecting wirelessly to compatible devices, such as a smartphone. There are three USB interfaces for attaching peripherals, such as an external mouse, as well as VGA and HDMI ports giving you a good deal of flexibility when connecting to external monitors. The EasyNote Butterfly S-EC-010 impresses with its mobility and features and, while it's not as attractive as some and suffers from a poor keyboard, it is still a very competitive choice.